Summary: Julia just graduated as her high school valedictorian, has a full ride to college in the fall and a coveted summer internship clerking for a federal judge. But when her older sister, Sophie, shows up at the graduation determined to reveal some long buried secrets, Julia's carefully constructed plans come to a halt. Instead of the summer she had painstakingly laid out, Julia follows Sophie back to Vermont, where Sophie is opening a bakery—and struggling with some secrets of her own. What follows is a summer of revelations—some heartwarming, some heartbreaking, and all slowly pointing Julia toward a new understanding of both herself and of the sister she never really knew. Our review: There are some books you read by accident. Something about the cover or title grabs you and the next thing you know the book is in your hand. I received The Sweetness of Salt from a book tour, merely choosing it from reading the summary, and was I ever glad I did. Cecilia Galante's writing sucked me in so completely I felt I was the best friend of main character Julia. When I first met Julia she was in her bedroom, looking out her window at Milo, the boy across the street who happens to be the brother of her closest friend, Zoe, and also the guy she is in love with. Every day she climbs into Milo's car along with Zoe and he drives them to school. How can she tell him how she feels? Plus, she has an internship which begins soon, all thanks to her lawyer dad. Summer and her life are pretty much planned out. Until older sister Sophie comes home to celebrate in Julia's graduation. Once again, Sophie gets into an anger-filled argument with their parents and something slips out. Something which will set Julia on the journey of her life. The beauty of The Sweetness of Salt--like some of my other most loved contemporary novels--lies in the heart of its main character. By that I mean the things Julia goes through: her relationships, her home life, how her background has helped mold her into who she is (or thinks she is). Julia is like so many of us: intelligent, has a good family, listens to her parents, leads a sheltered life. But when Sophie leaves an unexpected present for her younger sister, the gift is not only unforgettable but sends shock waves through the entire family. The solid foundation Julia considered as her life will crack. I won't spoil any surprises. I will tell you this book is worth reading to share along with Julia's journey--to find herself she has to help the sister she once adored but now regards as problematic; let Milo know her feelings; and figure out the person she thought she was isn't necessarily true. Julia has to find her own path and not the one dictated by her parents. 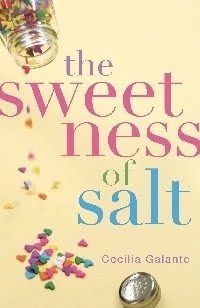 The Sweetness of Salt was a great read and one book I immediately cherished so much I went out and bought the hardcover. Sophie was an emotional young woman with a strong front, trying to find happiness in life. She was instantly relatable and I enjoyed her relationship with Sophie and her parents. The family dynamics were realistic, Milo was swoon worthy, the family secrets were heartbreaking, the baking made me hungry, and the rustic setting of a small Vermont town all combined together to make The Sweetness of Salt a charming and cherished read. Favorite excerpt: ""That's all that goes into your cookies?" Sophie shrugged. "Well, we have to add the chocolate and walnuts and toffee at the end, but yeah, all this stuff makes up the base of the dough." She reached for a tiny white dish on top of the stove. "Oops, and salt. I almost forgot the salt." "Salt?" I wrinkled my nose, and then widened my eyes. "Is that your secret ingredient?" Sophie laughed. "Salt isn't a secret ingredient, doofus. Besides, you just add a pinch. Salt brings out all the flavors." She paused. "It's weird, isn't it? How something so opposite of sweet can make things taste even better?" "How does it do that?" I asked. Cover comment: Not one of my favorite covers. I do like the little hearts.